With this option you can measure and correct for cell motion, thermal drift, shaking, and other types of movement (x-y-z translation and axial rotation). Both the measurement and subsequent stabilization are done in 3D and at sub-pixel level. The Stabilizer not only stabilizes 2D or 3D time series, but it also allows the alignment of slices within a 3D stack. 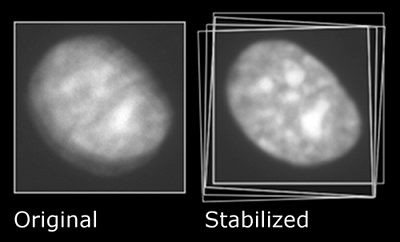 The Object Stabilizer can be found in the Analysis menu in Huygens Essential and in the Deconvolution menu in Huygens Professional. As it's a crucial step for deconvolving STED data it is integrated in the STED and STED 3D optical options. Images show the sum of four time frames of an apoptotic cell stained with fluorescent H2B nuclear protein. Time interval between slices is 300 seconds. Courtesy of M. Varecha and M. Kozubek, Masaryk University, Czech Republic. Stabilization over time works best if the 3D time series has been deconvolved first. Deconvolution enhances resolution and reduces noise, which helps to analyze motion. The stabilization in time series refers to the image as a whole and not to the individual objects that move over time. These natural individual movements over time are tracked with the Object Tracker Option. Cross correlation. This can be considered an 'all-round method'. It can correct for both x-y-z translation and axial rotation. Adjacent time frames are compared and the program tries to find the best alignment by maximizing structural overlap. A spherical region of interest can be defined to stabilize a particular part of the image. Model-based correlation. When the geometry of the imaged object did not change much during the acquisition, then the time series can be stabilized using a model of the object. The stabilizer creates the model automatically. Multi object tracking. When your image contains well-defined objects, i.e. nuclei or small particles, then the image may be stabilized using object tracking. Objects are tracked over time and their average movement is used to stabilize the time series. Center of mass alignment. This method works best if the image contains a single large object. No objects should cross the image borders, and the contrast between object and background should be high. 3D alignment can be applied prior to deconvolution if the stack suffers from "severe" misalignment between adjacent slices (e.g. due to temperature changes altering the Z-stepper position). In those cases the Object Stabilizer may improve the deconvolution of 3D stacks and can be applied beforehand. In all other cases applying deconvolution first is preferable.